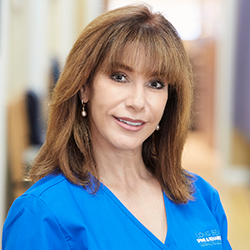 A veteran member of our team since 2007, Sylvia earned her massage therapy certification in 2000 from California College of Physical Arts, in Huntington Beach, CA. In conjunction with continuing education classes from Healing Hands School of Holistic Health, Sylvia has accrued over 1,000 hours of massage training. Her various modalities of massage include Reflexology/ Acupressure, Shiatsu, Sports, Deep Tissue Sculpting, Neuromuscular Release, and Swedish/Relaxation Massage. She enjoys the challenge of helping patients with their specific problem areas, using deep work that aids in increasing mobility and decreasing pain to enhance and speed their recovery.